Do you need to sell a home as well? We can help with that too! Our sister company, Brown & Company at McGraw Realtors (BCO), is a top real estate team serving Tulsa and the surrounding area. Simplify the process by having just one point of contact for the sale of your entire estate! And you will be entrusting that sale to the top service providers in both home and estate sales: ESP and BCO – a winning combination for top-notice service in the sale of your most valuable assets. 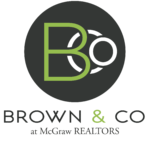 Learn more about Brown & Company at McGraw Realtors here and call us today! Check out our Current Sale Photos Here!